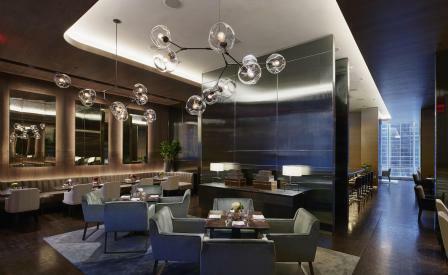 There was never any doubt that the Park Hyatt in New York would open a restaurant anything other than elegant. Bevy is the second incarnation of the hotel’s restaurant space. Designed by Yabu Pushelberg and newly installed with custom paintings by Moss and Lam, the new American restaurant is split into two dining rooms with Lindsay Adelman lighting hanging overhead. Sophisticated tonal carpets, antique mirrors and a softly underlit walnut bar give the space a warm and inviting atmosphere – all the better to enjoy chef Chad Brauze’s new American menu. Already a favourite of locals and guests alike, the exquisite, yet hearty fare includes poached monkfish tail and smoked Mangalista pork collar, which is all sourced seasonally from a trusted roster of local producers and farmers to ensure the best quality. The signature feature of the restaurant is undoubtedly the 20,000 node, interactive lighting sculpture by Random International. Entitled Swarm Study XI, the artwork is inspired by the collective behaviour of a flock of starlings and translates that phenomenon into moving light. Composed of individually programmed pieces yet working in unison to create a harmonious beauty, the piece distills the energetic cacophony of New York to a tee.